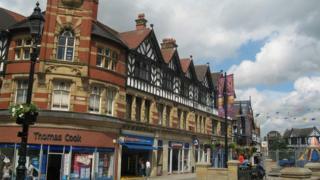 Does Wigan have the answer to Wales' reduced council budgets? Councils across Wales are once again looking to make savings after facing reduced budget settlements last week. With some areas facing a 1% cut the Welsh Local Government Association (WLGA) warned services were wearing down "to the point of collapse". Austerity has forced local authorities across the UK to slash services and hike council tax for almost a decade. But one council in the north west of England said it had kept council tax low by approaching things differently. Wigan, a former mining community in Greater Manchester, launched the Wigan Deal in 2014 when it was facing a 30% cut to its budget, amounting to a shortfall of £107m. The Institute of Fiscal Studies said it was one of three UK authorities worst affected by austerity. "We knew we had to do something radically different," said Wigan's chief executive Donna Hall. Residents were consulted on a radical local authority model, which puts more emphasis on volunteering and citizenship. In a public consultation 83% of residents supported the principals of the deal. Ms Hall said: "The deal is a very unique contract between the council and residents, and really it's evolved to become a contract between citizen and state which is completely different from any other local government model we've ever seen." The Wigan Deal asks residents to commit to things such as looking after their health, recycling more, looking after their neighbours and volunteering. Community groups run local amenities such as swimming pools and some previously council-owned buildings have been transferred to community ownership. Many of the council's services are available online only. The changes have led to savings and the council tax is the second lowest in Greater Manchester. "We've managed to save about £120m altogether since austerity began by thinking differently," said Ms Hall. "We've kept most of our facilities open. We've built new Sure Start centres, we've also invested £9m in our Community Investment Fund - at a time when other places are cutting the amount they give to communities." One of the beneficiaries of the Community Investment Fund is Sunshine House in Scholes, a deprived area of Wigan. It is a community hub which has 2,000 people through its doors every week to attend workshops, support groups, activities, courses, or just to visit the community cafe for a low cost meal. The building formed part of an asset transfer in 2014 and now the centre is mostly self sufficient, run by a band of dedicated volunteers, some of whom have now progressed to paid work. Sunshine House's senior manager Barbara Nettleton said: "When the austerity measures came in, when they started to look at the day centres, we looked to asset transfer so we could take on a bit more. Hence what you see today is down to the investment the council did with The Deal in the first place. "We deliver some really good services that the council probably couldn't under the old system because you stayed in your ways and hadn't had to look at changes." The model for the Wigan Deal is now being looked at by other local authorities. Ms Hall said: "We had a Local Government Association peer review last week and Tom Riordan, the chief executive of Leeds City Council, described the deal as the best approach to remodelling public services that he's ever seen which should be rolled out nationally as a template for a different way of working. "We are really proud of that... we've seen massive improvements in people's lives."